It’s better to miss a train by an hour than by two minutes. On our return trip from Hong Kong we missed the train from Shanghai to Hangzhou by two crummy minutes. The level of frustration in missing a train is inversely proportional to the amount of time by which it is missed: miss it by an hour and you will shrug your shoulders; miss it by two minutes and you will summon every word of street language and invective and socially unacceptable description in your vocabulary and put them all into one sentence. You know what I’m saying? 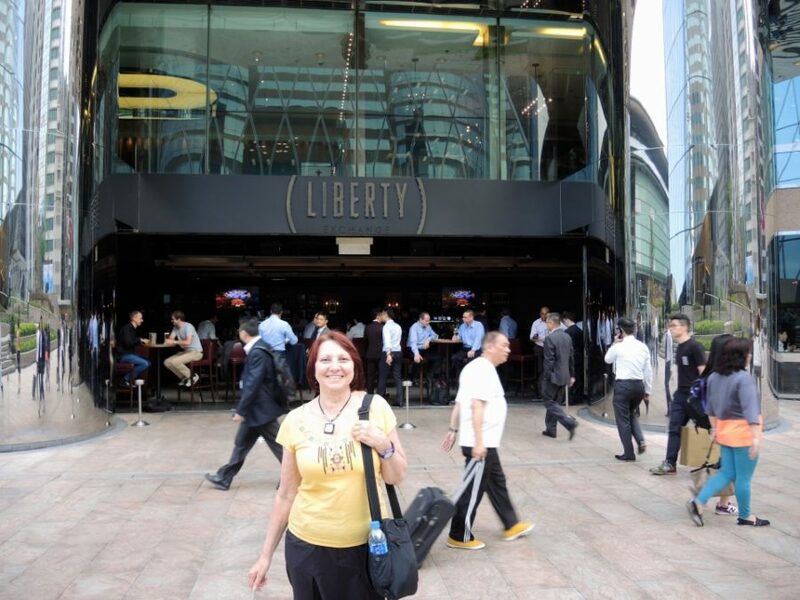 Char and I stopped for drinks and a pizza at Liberty Exchange before leaving Hong Kong. To be sure, the fun for the day did not end with that episode. No, no. We managed to . . . well, let me just say that if you can avoid transportation opportunities that run the risk of you being abandoned on a major interstate with a European couple in a country where you can’t speak the language or read the signage, that would be a good thing. The rub in this story is that all of the transportation systems performed as expected. I had underestimated the amount of time needed to travel from the airport to the train station in Shanghai. The two Shanghai terminals are across the city from each other, and the ride from one to the other takes something like 01:45 or 02:00. When I made the initial reservations, I thought I remembered that trip taking 30 to 45 minutes. My wife, Char, and I discovered this on the trip to Hong Kong. The timing didn’t affect us then because we had even more time built into our schedule, which was a good thing because we missed a stop on the metro heading for Shanghai airport. Furthermore, we had completely forgotten about immigration; going to Hong Kong is like going to another country, even though it’s not, and you go through all of the same security, customs, and immigration checks. We reviewed the return trip timing as we waited for the flight to Hong Kong. We realized that making the train would be close. We discussed alternatives, like taking a cab to the train station, or taking another train. Did I mention that our return trip coincided with the eve of the Chinese Labor Day holiday, and that every single seat in every form of public transport would be spoken for and that you could maybe get something on a standing-room-only basis, but only if you were willing to use your best pushing and shoving technique. We had done everything right and as we headed back to Hangzhou. It’s hard to say where we could have gotten those two minutes back. Immigration could have been just a bit faster. Maybe we should have run from the airplane and crowded in front of people just like all of those jerks I complain about. Maybe we could have gotten the metro train just before the one that we got. Maybe we should have done like the Chinese girl who was late for her train and felt entitled to barge forward in the security line at the train station with total lack of consideration for anyone else. Maybe we should have waited to go to the bathroom on the train. Anyway, we missed the train. As we walked up to the gate, the train information changed from green to red, which means that the train has departed. Then the gate information screen blinked again, and the next train was posted. The time was 1:32 p.m.
We decided to go to the ticket window and just buy another ticket and get on a later train. This was before we fully realized what was happening in public transportation for the holiday. On our first attempt, we bumped up against the language barrier. We got pointed to another window, where we were reissued a ticket for a later train leaving at 9 p.m. And we didn’t have seats with the reissued tickets; they were standing-room-only tickets. We had gotten the reissued tickets by 2:30, so all we had to do was pass six hours waiting for the train. As the afternoon wore on, we tried to get tickets for other trains, but by then they were all booked. Then we thought we would take a bus, so we navigated to the bus information place on another floor and discovered that there were no busses to Hangzhou. That pretty much left a taxi, which, if selected, would mean a three-hour ride and three-hour fare to Hangzhou, around $150. More than we were willing to spend. On our way back to the waiting room, we happened across a European couple from Spain—Clara, who is Spanish, and Antonio, who is Italian. They were a pair, married I think, and they were on holiday in China. They were on their way to Hangzhou to take in a show at West Lake that evening, and they were looking for a ride. Clara asked about busses. I told her there were none, and that the only option appeared to be a taxi. So we agreed, the four of us, to investigate splitting the cost of a taxi. We found the taxi stand, which had a line about a block long inside the terminal, and decided against that. But a fellow approached us, dressed in a suit with open collar, and kept saying, “Hello, hello. No waiting. No waiting.” He was a hustler. He was a private citizen who owned a car, and he was trying to pick off western-looking customers for a ride. These guys are not licensed. They don’t speak our language (if they do, they don’t let on) and we don’t speak theirs. They’re the kind of guys who will agree to anything; then, once you’re in the car and away from the station, they suddenly change the rules, or do something you didn’t discuss. They just have a sliminess about them that dings every alarm bell and red flag in your head: STAY AWAY FROM THIS GUY; YOU’RE ASKING FOR TROUBLE. So we hired the guy to take us to Hangzhou for 900 yuan ($144). (Now you know why I’m not rich.) He wanted 1000 yuan, but Antonio negotiated to 900. For Char and me, it was worth $72 by this time to get out of Shanghai. Antonio and Clara were trying to get to an 8 p.m. show, so off we went. Now, in matters of this type, there is a kind of delicate balance that needs to be maintained. From our point of view, if we pay the guy in full, you pass the leverage to him; he can now stop anywhere on the freeway, claim something further needs to be negotiated, and get (extort) more money from you. Or maybe worse. From his point of view, if he doesn’t get any money, we could stiff him once we get to Hangzhou. He is not licensed and probably has little leverage at that point. If questioned, we could claim that we agreed to less or that he didn’t take us to where he said he would. How would you handle this? The driver started driving. Traffic was heavy around the train station, but we moved on. As we drove, he fills out this receipt for 900 yuan, hands it to me (I was in the front seat), and points to it and says, “Money, money,” and taps the paper. We talk and try to make him understand that we will pay half now and half when we get to Hangzhou. He taps the paper and says, “Money, money.” Meanwhile, he’s on the phone—a lot. Phone conversations start and stop, and after about 45 minutes of travel, he takes the receipt and scribbles 800 yuan across it and asks for 800 instead of 900 and says, in broken English while tapping on the paper, “Eight hundred. One hundred in Hangzhou.” We go back and forth a bit, but finally capitulate and give him the 800 yuan. He drives on. We check his route against our iPhone GPS, see that the car is heading in the correct direction, and start to feel slightly more comfortable. About then, he pulls over and drives up behind some cars on the side of the freeway. This was not entirely a good feeling. The driver gets out of the car and chats up a guy with a minivan. Antonio got out of the car. “Why did we stop,” he asked. “Motor car, motor car,” the driver said, pointing to the minivan. The clear implication was that he intended to hand us off to another driver who he said would drive us to Hangzhou. I have a difficult time thinking clearly in these types of situations, so I got out of the car and started yelling at the driver. The minivan driver was clearly surprised. I kept telling our driver to show his minivan-driver friend the money that we paid him. Of course, he didn’t. Antonio managed to find someone in one of the parked cars who could speak English, and further discussion ensued. But I think the minivan guy decided he didn’t want any part of it and drove off. With the intended relay driver gone, our driver finally got back into the car and headed for Hangzhou. But one little matter remained: he didn’t know the way. The telephone calls resumed again—this time, I think, not to hand us off, but more in a panic to figure out just how to get to Hangzhou. He had a GPS, which he engaged, but he kept slowing down at junctions, wondering, I think, which route to choose. He would engage the toll attendants in conversation, obviously asking directions. At one point, he simply did a 180 on the freeway. That is actually fairly common in China. If you’re going one way, and you want to go the opposite way, you just turn around and drive off. Any of several scenarios could explain what happened here, but this is my best guess: I think our driver saw an opportunity to make a month’s salary in one transaction. He agreed to take us to Hangzhou, but never intended to drive us there. As we drove off on the freeway, he called his colleague and arranged to meet out on the freeway. I think that he suddenly agreed to take the 800 yuan instead of the 900 yuan because he was going to pass us off to his friend and have us pay the friend the last 100 yuan in Hangzhou. However, I can only imagine what he might have told his colleague. He might have told him that he could make 800 yuan or 500 yuan or some other amount of money by driving us to Hangzhou. But what ever it was, I am certain he did not tell the second driver that he had just taken 800 yuan for his services. That is why I wanted him to show the second driver the money. The way I figure it, we would have gotten to Hangzhou and the second driver would have been expecting 800 yuan or 900 yuan and we would have given him 100 yuan. It’s not difficult to imagine how messy this could have gotten. We finally became convinced that we were headed for Hangzhou. The drive allowed us to get to know each other a bit more. Antonio and Clara take holiday every year, maybe more. They have been traveling to Asian countries. They expressed the notion that they like to be slightly uncomfortable in their travels. They commented that they haven’t chosen to go to South America because it would be too much like Europe. The Spanish settled South America, more or less, so the language would not be an issue for them. Antonio said that they really prefer to get themselves into a memorable experience of one kind or another. So there we were, right in the middle of it. Postscript: Antonio and Clara sent a note a few days later saying that they were back in Madrid. They also sent this photo. 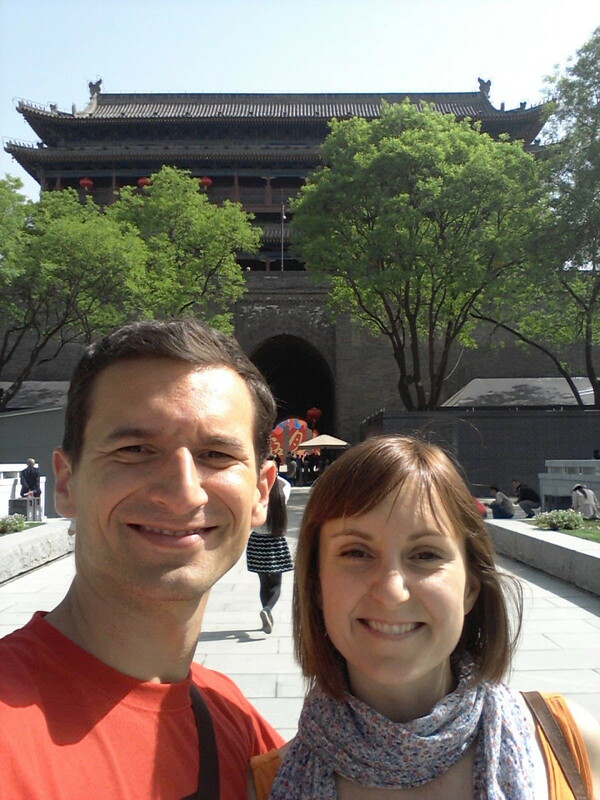 These are the two intrepid travelers who became our cohorts in one of our most memorable travel escapades. As it was, we did finally get delivered to Hangzhou about 8 p.m. Once the driver got close enough, he pulled off the freeway, turned onto the first street he came to at the exit, stopped the car and demanded the last 100 yuan; I think he considered his obligation to be complete. Antonio, who had negotiated to be delivered to the hotel at which he and Clara had a reservation, disagreed. Another dispute arose, and we finally just walked away. We had paid the guy $128 to drive us 102 miles. Of course, he had to go back, but I would say he easily cleared $100 on the deal. And he took three hours and forty-five minutes for what should have been a three-hour trip. Once we were in the street, however, only minutes passed before we were able to hail one of the ubiquitous Hangzhou taxis. If ever we felt secure again, it was getting into a cab in Hangzhou. They are great. For all of the cab rides we’ve had in Hangzhou, we’ve never had a bad experience. The drivers know where they are going, and they don’t expect tips, so what you see on the meter is what you pay. Our Shanghai driver had dropped us at one of the northern most points of the city. In 20 minutes or so, the cabbie pulled up to the hotel. We said our good-byes to Clara and Antonio, knowing we would never see them again and wishing we could have breakfast with them or at least have time for a photo. But, alas, the events of the evening did not permit it. Our lives crossed paths with those two young people for five hours in a place far away from each of our homes. All we have now is the memory and the story. But isn’t that why we travel, after all. The taxi driver was about to leave when we called to him and asked him for a ride to our apartment. It is just a short distance from the hotel. We paid the minimum fare: 11 yuan ($1.75). On the drive to the apartment I felt the city’s embrace. We had gone only a short distance when I recognized the street and realized where I was. I surprised myself. Hangzhou felt like home. This really wasn’t as scary as it seems and “all’s well that ends well.” Do wish we could have gotten to know Clara and Antonio better. They were a wonderful young couple with whom we seemed to share many interests.